How to become a LimeSDR innovator? After an amazing week at MWC, I got people reaching out to me that want to be a LimeSDR innovator. Here is a short guide on what to do and what we are working on next. 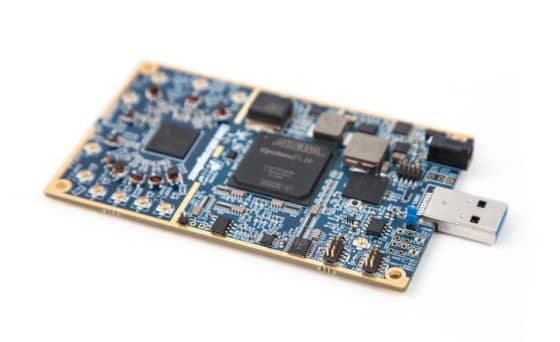 Start by getting your LimeSDR. At Canonical, the company behind Ubuntu, we started a new open source standard to allow anybody to package Linux software as an app. This new app standard is called a Snap and you can run Snaps on most Linux distributions and devices. To create snaps you can read more about them at Snapcraft.io and follow the base tutorials. Specifically for the LimeSDR there are some tools to include in your snap so there is an additional LimeSDR snap tutorial. Afterwards you can use snapcraft to upload the snap to the community LimeSDR store, follow the steps here. This will allow the community to go fast in improving the best ideas. Don’t like Bluetooth? Make a better protocol and get users immediately to use it. Same for 5G. Why not substitute it by CoolG instead. You no longer need a $100M to introduce a new wireless protocol to the world, just two LimeSDRs. Run your LimeSDR snaps on Ubuntu 16.04 or Ubuntu Core 16 after you plugged in your LimeSDR. You can afterwards use build.snapcraft.io to fully automate your work. Any change on GitHub can trigger your continuous integration tests and afterwards we build all your snaps for all target architectures and push it to the store. You will be able to download the snaps automatically afterwards and do machine functional testing. If the new version works you can move them to the stable channel and everybody that has them installed will automatically get the new update. If you made a mistake then anybody can easily rollback to the last working version. On MWC17 we showed the next step: open source mobile and IoT base stations with app stores. There will be a separate blog but the important part is that Lime and Canonical are creating a market both for LimeSDR innovators and any professional software vendor to sell their work via the LimeNet store. This store is by invitation only and will be controlled by Lime Micro so all the snaps are telco grade. They will fill up the stores of the new LimeNet base stations which will shortly be crowdfunded. These base stations can be bought by any telecom operator but since they are open source designs and commodity hardware we expect any enterprise to be able to afford them and in the future every home. Hotels are a good use case because you don’t want a four-star rating instead five on TripAdviser because a room or meeting room had spotty connectivity. Instead you get a base station and pay for spectrum as a service. This means telecom operators will be able to have mobile networks without investing in buying the hardware, electricity and management. Instead they get new revenues by supplying spectrum. This is just one of many examples of why you want an App Store on a mobile base station.